Indianapolis, IN (July 2016) Starting operations in 1995 Fairfield Collectibles is the largest die-cast and collectibles catalog in America. Back in 1995 U.S. die-cast collectors could only choose between Franklin Mint and Danbury Mint models and only in 1:24 scale. Fairfield broke the mold, introducing American collectors to larger 1:18 scale die-cast collectibles at much more reasonable prices than anything available from Franklin or Danbury. Fairfield Collectibles’ catalog and web site now offers a full range of die-cast products in all scales from 1:64 to 1:18 scale mailing over 2,000,000 catalogs a year to avid collectors nationwide! Fairfield Collectibles was one of the first die-cast merchants to offer Greenlight Collectibles product line way back in 2006 with the Indy Car line. Today our relationship has grown to include the full line of Greenlight products both in their catalog and on the web! 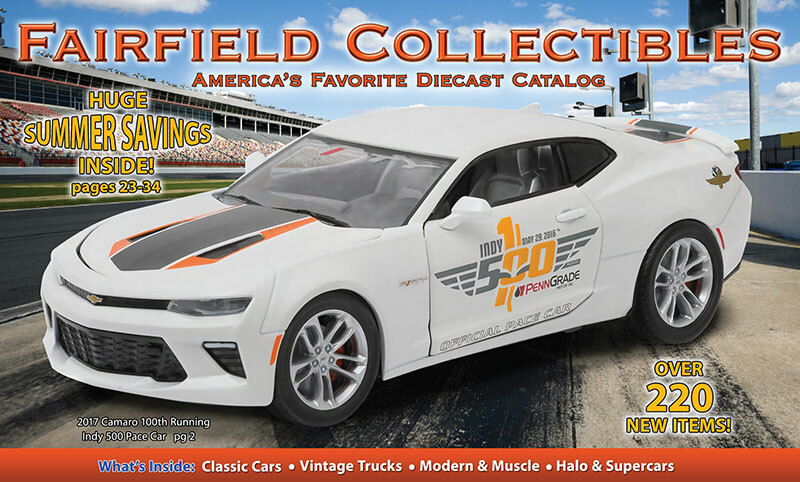 We are pleased to celebrate the 10th Anniversary of our growing relationship with Fairfield Collectibles and encourage Greenlight die-cast fans to go to their website and sign up for the email promotions and their catalog. Fairfield is serious about customer service shipping all orders within 24 hours and most on the same day! If for any reason a customer is not happy with a product they will go the extra mile to either replace or refund any purchase making sure every customer is happy! As the leader in the industry Fairfield’s combination of outstanding service, selection and pricing means you’ll always receive the best value for your die-cast dollar!